Our 350 sq. ft. licensed commercial kitchen is open to members 24-hours a day, seven days a week through an online scheduling calendar. It is fully outfitted with professional-grade equipment ready for food production, packaging, prepping, catering, and more. We also offer overnight parking for our area’s food trucks. La Dorita aims to break barriers of entry by taking on the financial risk of opening and operating a commercial kitchen and reducing all expenses to a fixed cost. A $350 initiation fee is required to become a member, along with membership dues of $35/month, regardless of kitchen use. All Kitchen Share members have access to discounted business and marketing consulting services ($75/hour for members as compared to $135/hour for non-members). Our kitchen’s hourly rental rates are determined on a sliding scale. Rates are listed below. Because our kitchen’s availability is determined upon a first-come basis for members who rent on an hourly basis, the majority of our members enter into a long term rental contracts to establish a set schedule for their production services. These contracts include access to secure storage space and average an hourly fee of $15-$17/hour ($13/hour for off-peak hours). The monthly contracts require that members provide a three-month termination notice prior to relocating their business production to another location. 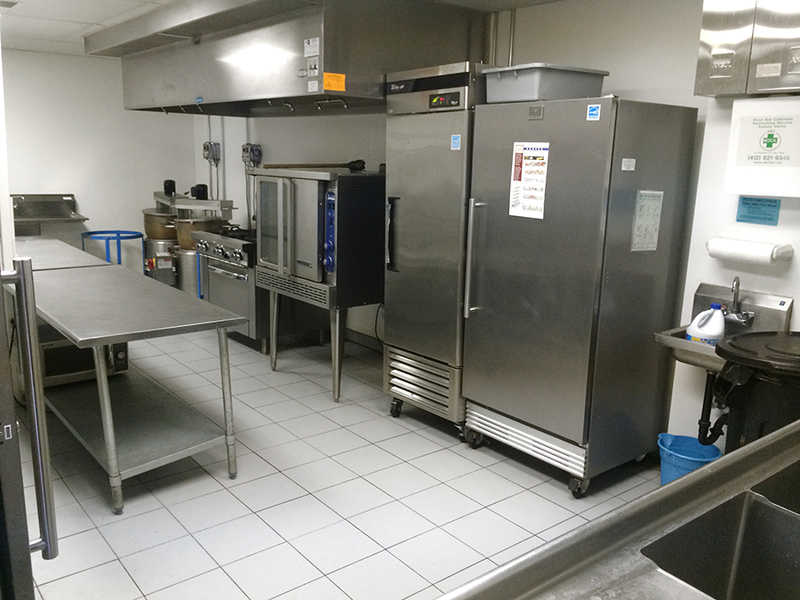 La Dorita’s commercial kitchen is a fully equipped kitchen designed for caterers and small businesses. It has everything you need to manufacture your product in an efficient manner. The kitchen is also available for small group cooking classes. If you are starting a business, La Dorita will give you a home, kitchen and business support all in one place at our facility located at 2312 Main Street, Rear, Sharpsburg, PA 15215. Need to test a recipe? Come to our facility. Need to make a ton of product for an event? Come to our facility. More than a kitchen member, you will become part of a community of makers working side by side to create something special. We’ll also share our relationships with local stores to help get your product out there and help you with the all too confusing process of retail distribution. How to get your business started as a member of La Dorita’s Kitchen Share program. There are a number of requirements that need to be completed before you can start operating from The Kitchen Space. Each of these is explained below. La Dorita requires all Kitchen Share members to hold liability insurance of $1M. Please supply us with a Certificate of Liability Insurance, with La Dorita, LLC 2312 Main Street Rear, Sharpsburg, PA 15215 listed as the certificate holder. While $1M sounds expensive, this coverage is typically available for only a few hundred dollars per year. Additionally, most wholesalers and retailers will require you to have this amount to sell your products. Check with your broker on your exact needs – if you need a broker, we are happy to recommend a couple that our members work with. This is a requirement of the Allegheny County Health Department for any food business. To obtain this, you will need to complete a course, or show evidence that a course has been completed. Generally, only one person per business is required to complete this course. Allegheny County Health Department offers a variety of Food Protection Certification options to meet the diverse needs of managers in the food industry; these options include certification classes, a recertification refresher course, and a challenge exam. Current food safety regulations require that a Certified Food Protection Manager be on-site during ALL HOURS of operation in facilities where food preparation occurs. For further details, please visit http://www.achd.net/food/food-cert-course-schedule.html. This is a requirement of the Allegheny County Department of Health Food Safety for any food business. Essentially, it permits you to carry on the business of manufacturing and selling food. There are three types of food enterprises. The purpose of Food Safety Program Plan Review is to assure that all equipment and construction in a new or remodeled food facility is in compliance with the Food Safety Regulations. Once a company becomes a member, La Dorita works closely with each member licensed within days of joining. A signed copy of the Policy Handbook. This sets out the rules, regulations and policies associated with actually using the kitchen share space. A membership fee of $350 made payable to La Dorita that is due at the time you are submitting the application. This will secure your initiation fee, and is in addition to the monthly $35 dues. We strongly recommend you submit this information prior to the first time that you use the kitchen so that we can work together to get you licensed in the most efficient and timely manner possible.